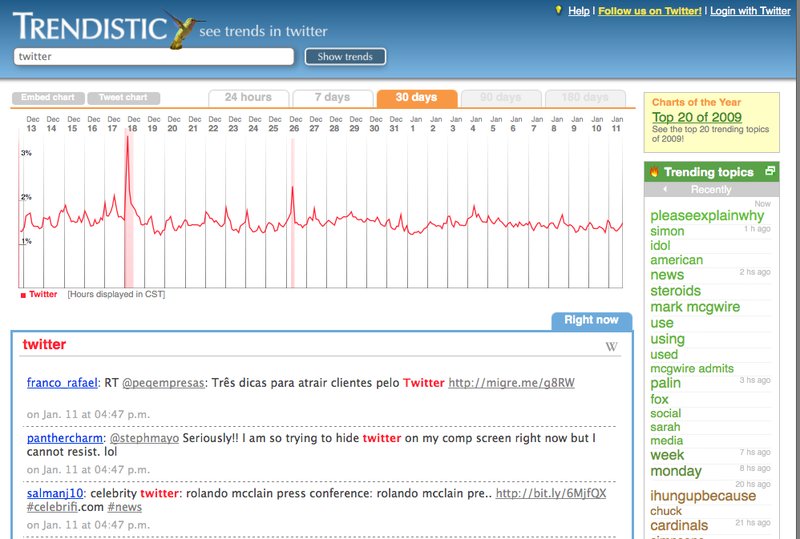 Today I discovered a Twitter tool called Trendistic.com and some interesting research by Dan Zarrella. Combining the tool and Zarrella’s reasearch can produce some interesting insights for those Twitter users looking to reach a larger segment of the Twitter audience. Enter any keyword to see how frequently its has been used on Twitter within the last 24 hours, 7 , 30, 90 or 180 days. 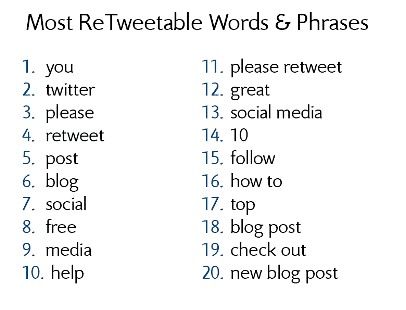 Zarrella has researched the most retweeted terms and produced a Top 20 list. Inputting some of Zarrella’s terms indeed confirms a high percentage of use within the Tweet Stream. Although Zarrella’s data doesn’t correlate directly with the Trendistic tool’s data, his keywords do provide a starting point for understanding which type of language is most often used in both regular Tweets and Retweets. Consider combining Zarrella’s list and the Trendisitc tool when preparing to target segments within the Twitter audience. I noticed Twitter.com is now displaying the number of new Tweets that occur in between page refreshes and views over the web. Previously, Twitter users who viewed their accounts on the web wouldn’t have any idea how many Tweets had been made in between the time they viewed one page from the next. With the Tweet Stream growing ever more volumunous for active Twitter users, this simple improvement may help prevent Stream Fatigue or cause more of it. This Twitter account (MemChip) automates the Trending Topics feed and then Tweets the results to the Twitter audience once every ten minutes. It takes some concentration to parse each Trending Topic from the Tweet but there are ten subjects in each Tweet. I have created an archive of Twitter’s Trending Topics by grabbing the RSS feed and sending it to my Google Reader. Although reviewing the contents of Twitter’s Trending Topics Tweet Stream once daily is more than enough to cause stream fatigue, I find the process and results quite instructive. As every web user of Twitter.com knows by now, Twitter has been offline and inaccessible to web Tweeters. The following graph from Nathan Reed illustrates the drop in Tweeting that has occurred as a result of the Twitter.com DDOS attack. Twitter’s Tweet Stream effectively dried up during the DDOS Attach according to Reed’s Tweet per Hour chart. What Happens To Your Tweets After A Week? At what point does Twitter stop archiving Twitter account tweet data – after one week, one month, one year? I can’t access my Twitter account’s updates beyond roughly the last one hundred Tweets. Who’s responsible for archiving Twitter account updates – the 140 characters Tweet Stream – Twitter account holders or Twitter? … Apparently Twitter isn’t responsible for archiving Tweets. If Twitter was responsible for archiving all of an account’s Tweets, I would be able to get to more than 100 of mine.